William Cox was born in Yeovil on 12 November 1820 and baptised at St John's church on 11 December 1820. He was the elder son of carpenter, builder and Town Councillor John Cox (1798-1878) and Mary née Hancock (1799-1871). 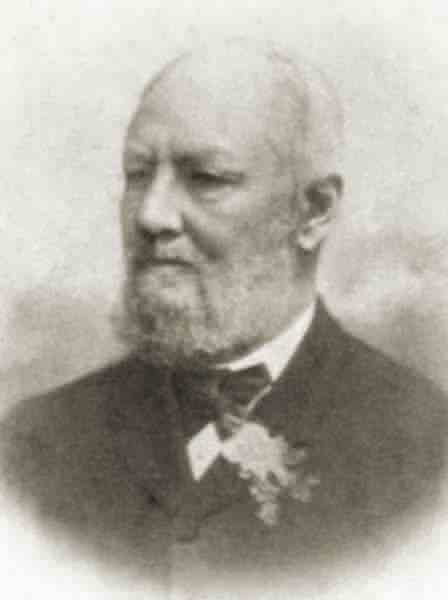 His younger brother was builder Frederick Cox (1825-1887). In the 1851 census William and his mother were living in the Borough with his mother's brother, watch maker and jeweller James Hancock and sister Sarah, together with a domestic servant. 60-year old James listed his occupation as 'Watchmaker & Jeweller, employing 2 men', Sarah was listed as his housekeeper, Mary was a 'Carpenter's Wife' and William Cox was described as a 'Watchmaker's Assistant' - clearly one of the two men employed by James. In 1850 and 1852 James Hancock & Co of Middle Street were listed in several trade directories as, variously, Watchmakers, Clockmakers, Silversmiths and Jewellers. In 1854 the company was listed as Hancock & Co in the Churchwardens' Accounts. On 2 November 1854, at Yeovil, William married Sarah Guppy (1827-1881) of Hardington Mandeville. Sarah was the daughter of farmer William Guppy and his wife Susannah. By 1855 James Hancock had clearly gone into partnership with his sister's son and long-time assistant, William Cox. The new company of Hancock & Cox, were listed in several trade directories from 1855 until the spring of 1862 when James Hancock died at the age of 71. During the 1850s William became a member of the Yeovil Mutual Improvement Society and by 1859 was sitting on its committee. He was elected Vice-Chairman in 1864. By the mid-1860s he was also Chairman of the Yeovil Old True Blue Benefit Society. In 1869 he donated £20 towards the Yeovil General Dispensary - Yeovil's first hospital. In November 1866 he was nominated to stand for election as a councillor in the municipal election, but he issued notices that he did not intend to stand as a candidate at this time. He did, however, stand at a later date and was elected to the Corporation in 1871. By 1861 William and Sarah were living at Clarence Place - a small terrace of four dwellings off the west side of the southern end of Clarence Street. It was sandwiched between Joseph Brutton's malthouse to its north and the Yeovil Iron & Brass Foundry, owned by Sansbury & Savery then William Rowe and finally acquired by James Petter in 1872. In the census William gave his occupation as 'Silversmith &c'. In 1863 William became a Freemason, joining the Lodge of Brotherly Love in Yeovil. His brother Frederick had been initiated into the lodge two years earlier. Frederick served as Worshipful Master of the Lodge in 1868 and William became Worshipful Master in 1874. Following the death of James Hancock, William and Sarah returned to live above the jeweller's shop in Middle Street. In the 1871 census they were listed there, together with a domestic servant. It appears that by this time the company had expanded since William gave his occupation as 'Silversmith employing 5 Men, 7 Boys'. 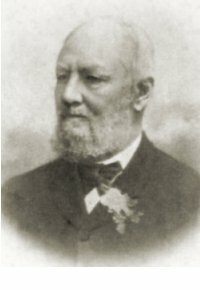 William Cox continued to run the company as Hancock & Cox until 1872, after which the company was listed as Hancock, Cox & Co, of Middle Street (until 1894). Sarah died in Yeovil during early 1881, aged 75. At the time of the 1881 census, held on 3 April, William was living at The Park with a cook and a housemaid. He was described as a widower and he gave his occupation as an annuitant. William served as a Town Councillor for over thirty years, latterly on the aldermanic bench, and was twice elected Mayor of Yeovil serving from 1882 until 1884. He was elected a Justice of the Peace in 1888 and ultimately became the Borough's senior magistrate. He was also a member of the Board of Guardians, the Hospital Committee and the Yeovil Agricultural Society. In 1888 William married Jane Jennings at Taunton. They were both aged 68. In the 1891 census William and Jane, together with a servant, were living at 6 The Park. William gave his occupation as 'J.P. & Director of Public Company and living on own means". They were at the same address in the 1901 census, at which time William gave his occupation as 'Jeweller (Retired). Jane died in 1905/06 and in the 1911 census 90-year old William was living at 24 The Park (probably a re-numbering of the street rather than a house move) with a nurse. After a long illness, William Cox died at home in Yeovil on 11 June 1911. He was 90 years old and was interred in Yeovil Cemetery. The 11 December 1820 record of William' baptism from the register of St John's church. 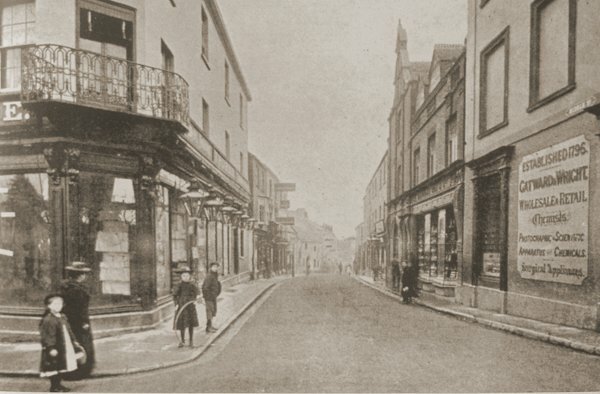 This photograph is of Middle Street seen from the Borough and dates to about 1895. At left is London House, at this time being run by George Wadman. At right is the side of the Medical Hall which, at this time was occupied by wholesale and retail chemists Gatward & Wright. Next door to the Medical Hall was the International Stores that had earlier been the premises of clockmaker, silversmith and jeweller John White Hancock from the 1820s, then his son James Hancock and finally Hancock, Cox & Co, Clock and Watch Makers run by William Cox until about 1894. 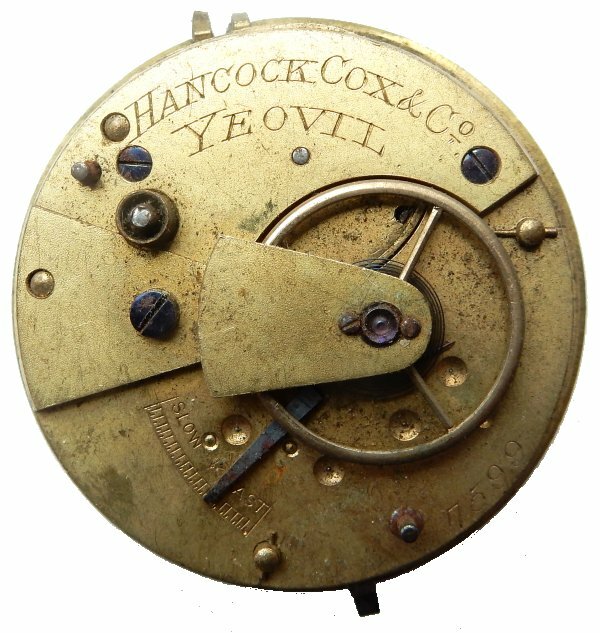 A pocket watch movement by Hancock Cox & Co (and yes, this is magnified) dating to between 1872 and 1894. It measures 1¾" (44mm) in diameter. 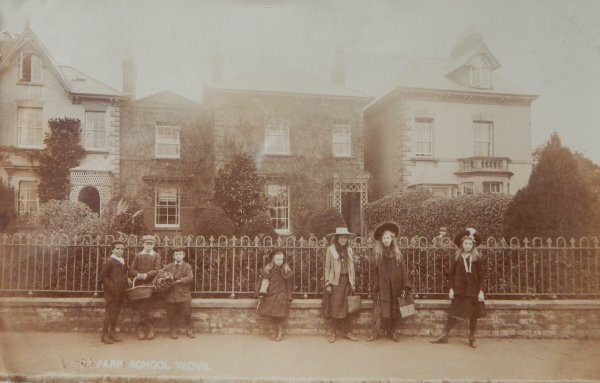 A postcard of the Park School (the centre building), posted in 1905. The house at right was William Cox's house from at least 1881 until his death. This photograph is from a 1952 newspaper article and was taken on the occasion of the opening of Sidney Gardens in June 1898. 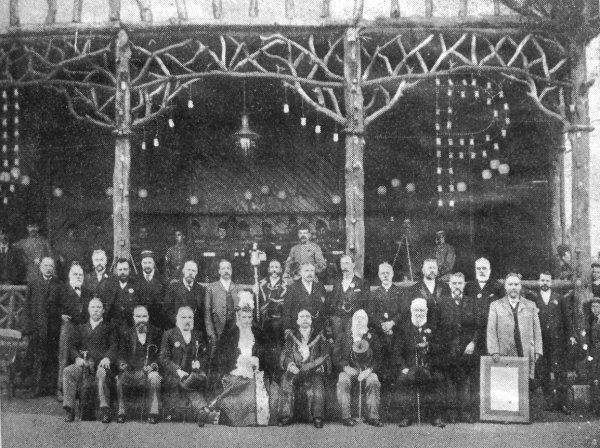 The group, photographed with the Mayor, Mr John Vincent, has as its background the thatched bandstand given by Mr James Bazeley Petter to mark the opening. 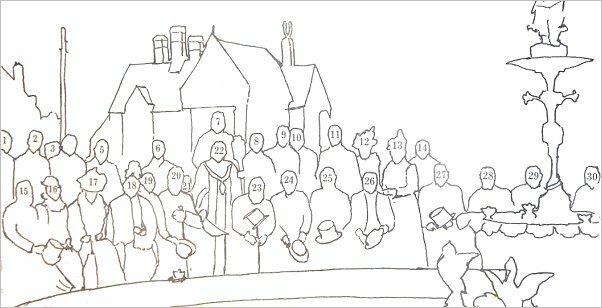 Standing (left to right) are: - E Benson, W Summers, J Kerby Whitby, Mr Brown, William Maynard, GH Gould, Edward Samuel Ewens, Henry Jesty (mace-bearer), William W Johnson, Charles J Hook, John Bazeley Petter (donor), W Armitage (Borough Surveyor), John Howe Farley, Walter J Nosworthy, William Beale Collins, Charles Fox. Sitting - Levi Beer, CW Pittard, Sidney Watts, Mrs Vincent, John Vincent (Mayor), Joseph Chaffey Moore, William Cox. 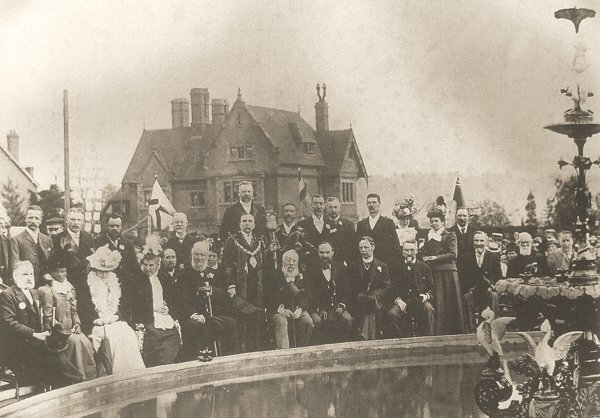 The presentation of the Sidney Gardens fountain on 24 May 1899. You'd have thought at least one of 'em could have raised a slight smile. William Cox is No 20 on the drawing below. 1 Cllr GH Gould, 2 Cllr Edward Samuel Ewens, 4 Cllr William W Johnson, 5 G Gawler, 6 Cllr James Bazeley Petter, 7 WG Armytage (Borough Surveyor), Henry Jesty (Mace Bearer), 9 Cllr Charles Hook, 10 JK Whitby, 11 Cllr HF Raymond, 14 William Maynard, 15 Alderman Sidney Watts, 16 Miss Watts, 17 Miss Vincent, 18 Mrs Vincent, 20 Alderman William Cox, 22 Mayor John Vincent, 23 Alderman Joseph Chaffey Moore, 24 Cllr Charles Wreford Pittard, 25 Henry Butler Batten (Town Clerk), 26 John H Farley (who donated the fountain), 27 Ebenezer Pittard, 29 William Beale Collins. A brief outline of William Cox's life and a report on his funeral from the 16 June 1911 edition of the Western Gazette.